It was 4:30 in the morning in the holy city of Varanasi, India, when I got a strange message from my 15-year-old son, Sam. “Dad, give me a call as soon as you can.” I was up early to attend a religious festival, and I made the call. The first thing Sam calmly said to me when he picked up the phone was, “Dad, don’t freak out, but mom’s been in an accident, and she’s in a helicopter being flown off the mountain.” The mountain, that is, that she had basically fallen off. I spent the next two hours trying to get a sense of what exactly had happened. By this point, news had already traveled to people back home in Utah, and I was getting all kinds of worried messages from them. Imagine this for a minute: I was in India staring at the Ganges River, getting bits and pieces of information from friends and family in the United States, about my wife who was in a helicopter being flown off a big mountain to a hospital in New Zealand, where we are living for the year. You couldn’t pick three other points on the globe that were much farther apart. Disorienting doesn’t even begin to describe the experience. Through some miracle of connecting flights just happening to match up perfectly and incredible customer service at Singapore Airlines, I could move my flight up a whole day. But even with everything falling into place, I was still looking at close to 24 hours of travel. I talked to the search and rescue team who had taken my wife off the mountain just before my six-hour flight from India to Singapore. At that time, I was told my wife had a severe concussion, a collapsed lung and a broken back. I spent the five-hour layover in Singapore scrambling to gather more information. By the time I boarded my flight for New Zealand, I knew she was stable, but that’s about it. In the end, despite the fractures in her back, hip and tailbone, she walked out of the hospital after only a few days and is on her way to a full recovery. But at the time, lost in my thoughts somewhere over the ocean, I had no idea what to expect. Over the following weeks, as it became clear my wife was going to be O.K., my thoughts started to shift from the regrets I would have had at the end of her life to what regrets I might have at the end of my own. “I bet I’ll wish I spent more time with my family,” I thought. That I did more climbs in the Tetons. That I took more creative risks at work. That I had been more kind. I’ll wish I took more time to listen to, laugh with and hug my children. So I made myself a little deathbed wish list. Why? Because on your deathbed, it’s too late. Similarly, waiting until a spouse is gone to share more hugs makes as much sense as waiting until your house is in cinders to buy a fire extinguisher. Personally, I found the simple act of writing that list down to be super illuminating. Doing so helped me recalibrate my actions with my values and restructure the way I spend my time to make sure I make space for the simple but important things. I’ve also found that sharing the list with others seems to be helpful. So, thanks for listening! Now, can I return the favor? What’s on your wish list? What might you regret if you don’t do it soon? 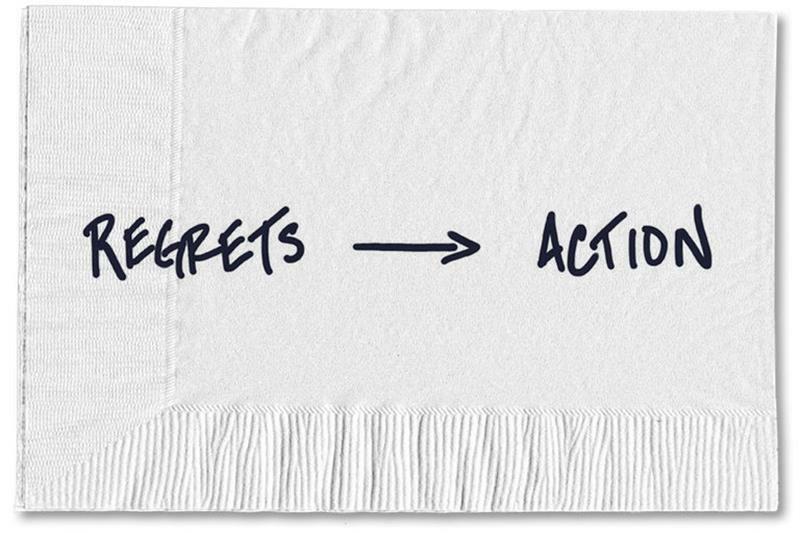 Please send me your thoughts to hello@behaviorgap.com and think of it as a first step toward doing now what you’ll wish you did later. I promise to read them all. About the Author : Carl Richards, a certified financial planner, is the author of “The Behavior Gap” and “The One-Page Financial Plan.” His sketches and essays appear weekly in the New York Times. 0 responses on "Featured Blog: The Wish List I Made After My Wife Almost Died"